This image was shot during a performance of The Velveteen Rabbit, the story of a toy rabbit that desperately wants to be real. 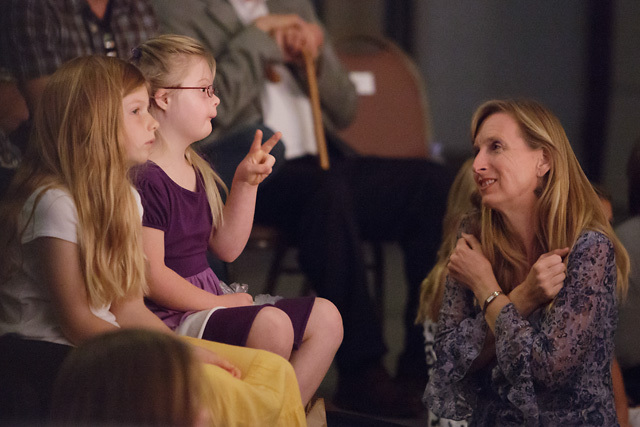 One of the key lines of the play happens when the toy horse explains to the rabbit: “When a child loves you, not just to play with, but really loves you, then you become real.” This photo shows a mother interpreting this line in sign language for her deaf child. It is often said that it is not the camera but the photographer that makes a great image. That is certainly true in the sense that even the best camera will produce rubbish if not used properly. However, on the other hand, we need to use the right equipment for the job, and sometimes it takes a certain camera to deal with a particular situation. I find it amazing that I was able to get this shot at all. It was almost pitch black in the audience, and the only light on the subjects here was the glow from the stage lights. None of the cameras I own (and they are all fine cameras) would have been able to produce this image. However, I had rented a 5D Mark III, which just came out a little over a month ago. Some of its strengths are its high ISO (low light) performance and its autofocus. Indeed, at ISO 25,600 it had no problems with this scene at all. This entry was posted in Picture of the Week and tagged canon eos 5D mark III, love, photography, sign language, theater, Velveteen Rabbit. Bookmark the permalink.